With its unique MegaWingLift attachment design, the GMK6400 all-terrain crane had the capacity and reach for this challenging lift. 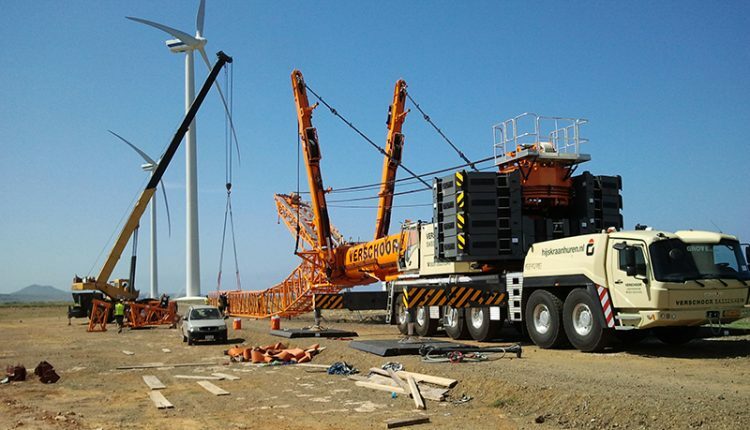 When a wind turbine at the Musselroe Wind Farm in Tasmania, Australia required a change of gearbox and generator, a Grove GMK6400 all-terrain crane turned out to be the perfect choice for the job. Woolnorth Wind Farms, owner and operator of the Musselroe location, contracted turbine manufacturer Vestas Wind Technology to manage the replacement work. Vestas Wind Technology, in turn, approached Pfeiffer Cranes to handle the lifting work, a family-owned crane rental business which serves the entire Tasmanian market. The company had no hesitation in selecting its Grove GMK6400 for the job, with a GMK4100L-1 also providing support. Dan Pfeiffer, crane operator and supervisor at Pfeiffer Cranes, said the unique MegaWingLift attachment on the GMK6400 helped ensure the job was a success. Working closely with Vestas Wind Technology, Pfeiffer Cranes completed the work, which saw the GMK6400 configured with 49.6 m of main boom and a 43 m luffing fly jib. In this setup, combined with the capacity-enhancing MegaWingLift with 115 t of counterweight, the crane had a capacity of 28 t, which it could lift out to a 30 m radius. This proved more than enough to place the 24 t gearbox and 10 t replacement generator, both of which were lifted to a height of 92.6 m. The lifting work took between 8 and 10 hours. The Musselroe Wind Farm in Tasmania, Australia, has 56 wind turbines with a power-generating capacity of 168 MW.